Today I wanted to share a dressier look featuring this beautiful striped tote from eBags online. At first I was concerned that the pattern in the bag would make it harder to wear. However, that is not the case! I have always gravitated toward solid colored bag, but now I know how versatile a great print can be! I wore this bag all last weekend on a short trip to San Diego-It was so versatile! I wore this with every outift! Wore it to the baseball game, to explore the city, on a whale watching excursion and to dinner! 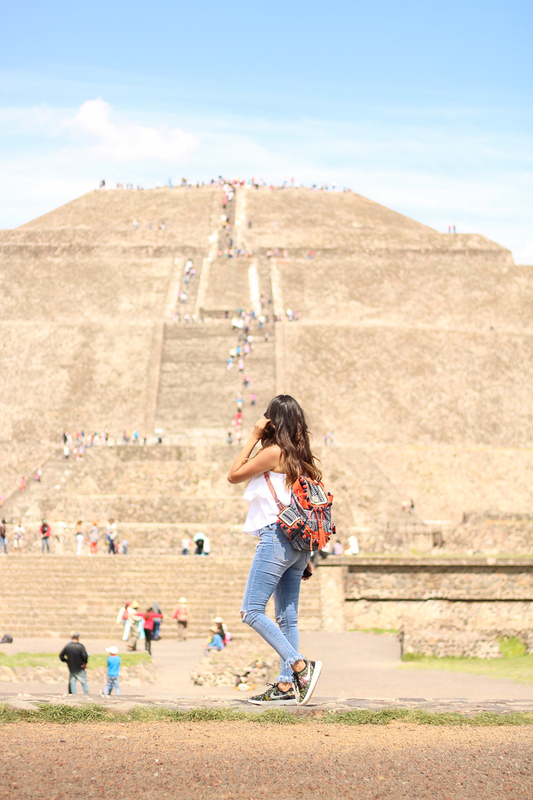 The size was perfect to carry all my necessities: camera, snacks, sunnies, light sweater etc. I love how this bag transitions effortlessly for day to night out! ( This was the day version, just in case you missed it) We celebrated my dad's big "5-0" birthday, so naturally there was a birthday dinner to celebrate. I ended up wearing this stripped outfit for our evening out. It was so much fun!! Love this tassel necklace! You look beautiful! Saw this dress in store and loved it. Looks perfect on you! You look so cute in that dress! I love the accessories you paired with it & the Kate Spade bag of course. This is so cute!! Love the striped look! This outfit is absoultely declious. You look like a little decorative cupcake. I love the color palette, so pretty. I can appreciate how you picked up the color of your bag with your necklace. Not too matchy matchy, just right. Love it. love this look. Everything is so perfect about it. I love the bag and the shades. Sounds like a great weekend! What a great piece to break off from the solid bag trend! loving all of the stripes! your necklaces are adorable too -- especially love the tassels! Love the dress and the bag! Such a pretty look! What a fun outfit! I love the color combinations and stripes are just so chic. Your bag is sooo adorable. this stripe bag is darling! love this cute summer look! That tassel necklace is amazing!! Love how you paired the stripped dress and bag together. Super cute look!! 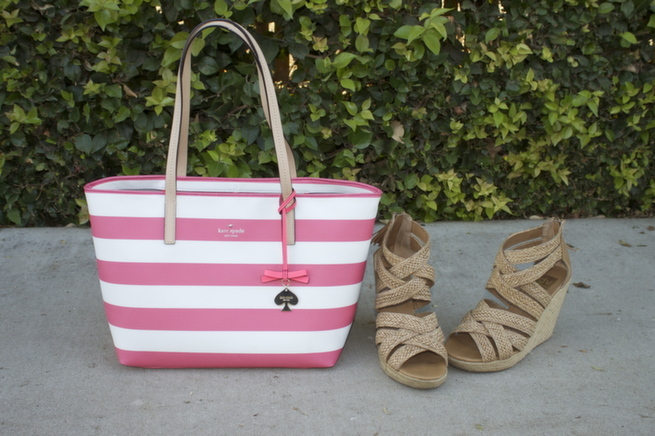 Love the striped bag, its so pretty! Aw, this is such a cute outfit and you look so pretty! I really like how well the bag goes with the dress and adds a pop of colour! I love the stripes on stripes look! Cool look, love the bag so much! Such a fun and perfect casual look for summer! You look so pretty! 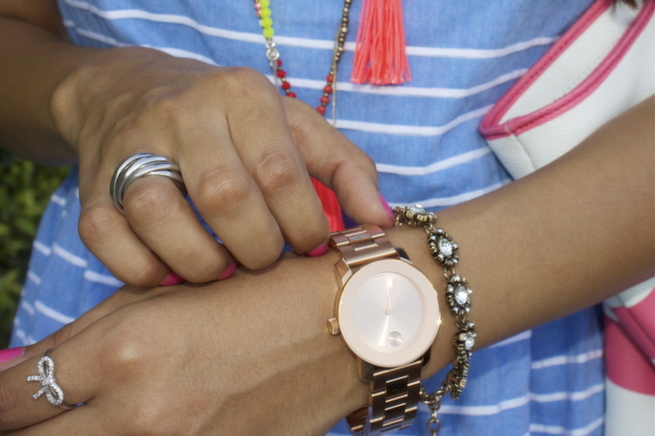 Love this fun stripe look I have just begun following you on Bloglovin! In love with this cute cute cute outfit. Everything is just perfect. The wedges are TDF! Honey you look adorable. Love these stripes together and your necklace is so pretty! Love the colors here. The strip blue dress paired with the pink bag is so pretty. I am such a sucker for stripes and this dress and tote are nothing short of amazing! So cute! Adorable dress, and I love the necklace! So obsessed with this fun summer look! I love all the accessories, especially your adorable necklaces. You look stunning! Beautiful job! I just love this dress and you styled it perfectly with your wedges. Such a flattering look on you! I have soft spot for stripes, it's classic and versatile print. You look gorgeous in this stripy look. Your bag is lovely. The color combo is perfect! You have just reminded me that I need to get a tassel necklace!